magnolia league looks soo good!! enjoy! Great books this week! Every time I see Claudia Gray's name come up I have to wonder why I didn't continue the series...I still don't know why, lol, because the first book was really great. I like the sound of The Magnolia League. I request a copy of Dark Moon as well from Netgalley, but have yet to receive a yes or no. Happy reading! Wondrous Strange sounds like a great book, I have had it on my wishlist for ages now! I also have Beautiful Creatures on my TBR pile, but it's so big, it's kind of putting me off reading it. Wow! 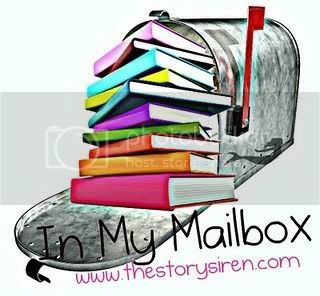 Full mailbox!! Have only heard of most of the titles and haven't read them. Will look for your reviews! You got some great books. Looking forward to reading your reviews! Cool mailbox. I'm curious to see what you think of Dark of the Moon and The Magnolia League. I debated reading them... Happy reading! Great books this week. Netgalley is the best. I love the cover of Radiance - so sweet. Awesome mailbox!! I've been dying to read Radiance!! The school my kids go to have it in the Book Fair and I am trying to get my daughter to get it for me:) Can't wait to read your reviews!! I really liked the Evernight series! The Magnolia League sounds really good, I just have so many books to read I figured I'd wait for now. It's hard though because I love books that take place in the south. Which was one thing I really loved about Beautiful Creatures, the southern flare. Thanks for stopping by my blog, I'm now a follower of your terrific blog! A great batch of books for the week. Did you get Radiance at the discounted price? I hope so! I've not heard of quite a few you got from NetGalley. Will look for your reviews to find out more. Wow! You done good gal! Not heard of a lot of the reads you picked up from Netgalley. Looking forward to hearing your thoughts in your review. Awesome books in the IMM. Can't wait to hear what you think of Radiance most. I really liked Stargazer; hope you do too. :) Enjoy all your books! Hi! I just found your blog! I've heard about The Magnolia League on NetGalley. I can't wait to hear what you think about it! Great mailbox! I've been thinking about checking out 'Beautiful Creatures' ... everyone seems to really love that series. Awesome books! I really love Beautiful Creatures & the Evernight series. Thanks for stopping by my blog, Christy. I see you have some great books in your pile. Great books! Beautiful Creatures sounds like a really interesting read (I'll have to borrow my sister's copy one day). I so want Woundrous strange and Radiance. I haven't heard of Dark of the Moon until now so I'm adding it to my list. I love Wondrous Strange and the series is great. Happy reading! Wow great books! I'm gonna look for your reviews :) I read Beautiful Creatures and enjoyed it and hoping you'll enjoy your books too! The Magnolia League is on my wishlist...hope it's a good one! Oh, these are just excellent! All these gorgeous covers, too! THE MAGNOLIA LEAGUE is definitely on my to-read list. Enjoy all of your books, Christy! And thanks for stopping by the blog, earlier! I love your book haul this week :D Wonderous Strange is a series I keep meaning to buy but just haven't got round to it. I've heard such good things. You got some great books. I just bought the third book of the Evernight series. Hope you like Stargazer. Thanks for stopping by my blog! You got some great stuff this week--will be looking for your reviews of Pregnant Pause and Never Eighteen! Some of my favorites there...Wonderous Strange, Beautiful Creatures. I really enjoyed Radiance, too...its a great middle grade book! Great books! I got Magnolia League too and can't wait to read it. I loved Radiance. The character of Riley is my favorite--my students really enjoyed this novel as well. Enjoy all your books! You really had a great week in the mailbox. I really enjoyed Beautiful Creatures. Happy reading and thanks for hopping by my blog. Never 18 sounds really good! Great books this week! I'm super interested in reading your review of The Magnolia League. I'm on the fence about reading that one. Hope you enjoy all your books! I liked Beautiful Creatures, Radiance and Strgazer! I hope you like them too. Thanks for stopping by my blog and happy reading! Great book haul this week! I absolutely loved Beautiful Creatures and can't wait to read your thoughts. Have a great week! Great mailbox hon!!! I cant wait to hear what you think! Thank you for stopping by! You had a great week! I can't wait to start Beautiful Creatures! I've heard nothing but good things about it! Don't you just love netGalley? Amazing books this week. p.s. thanks for stopping by our blog. I really think you will enjoy wondrous strange and stargazed. I have them both ans they were really great. Im not a big fan of beautiful creatures so I look forward to you review! Hope you enjoy the all, happy reading! Great selection this week! Beautiful Creatures is great, and I really want to read Wondrous Strange too. Anyway, happy Reading and thanks for leaving a comment on my IMM yesterday! You've got a cool stack of books there! I just read the promo for Beautiful Creatures on the back pages of Blood Promise! I LOVED Shadow-kissed! It was amazing! haven't heard of the rest of the books, will check them out, thanks for the heads up!! Quick question? Can I have you blog? PLEASE! I love your blog name and design! So glad I found it. Oh, and I I just looked up Never Eighteen. Sounds so good. Thanks for putting that book on my radar. Oooh...Beautiful Creatures! I hope you love it. Just stopping by - I've always wanted to read Radiance by Alyson Noel, but I've never actually gotten to it. And I keep hearing about Beautiful Creatures but I'm always on the fence about it! Thanks Megan!! I'm looking forward to it!